For those hot summer days, you need a light and fresh meal that’s quick and easy to put together. It needs to be refreshing and simple, something that picks you up since it’s cool and delicious and easy to put together. The last thing you need to do is to spend an hour (or more) in the kitchen slaving away over a hot stove or heating the whole house up with the oven. 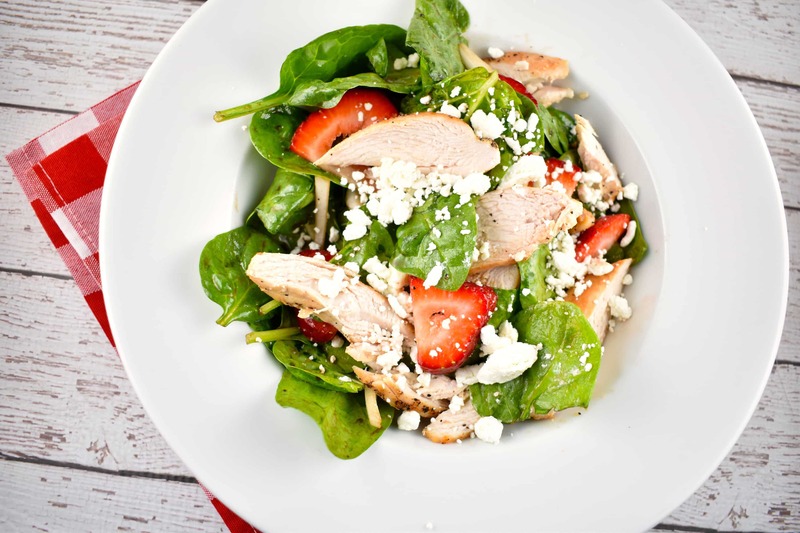 This Grilled Chicken Spinach and Strawberry Salad is perfect. It’s light and refreshing, easy to put together and packed with flavor. Creamy and tangy goat cheese that is perfectly paired with sweet strawberries. Tender grilled chicken adds the perfect amount of lean protein and the spinach adds a dose of vitamins, minerals and fiber. Everything is topped with a bold and creamy balsamic dressing. Having grilled chicken to add to salads is something that I really like to do in the summer. Summer is a perfect time to have lots of grilled meals. It’s perfect weather for grilling, it’s easy and simple, delicious and you don’t have to heat up the house to make supper. When you’re grilling one meal, it’s easy to toss on a couple of chicken breasts for lunch over the next couple of days. That way, you’ve got them ready to go. Once the chicken is grilled, it’s super easy to put this salad together. Just combine the spinach, strawberries, chicken and cheese. Then drizzle on the dressing. If this dressing is one you like and use quite a bit, it’s easy to make up a couple of batches and keep it in the fridge. You can use a blender bottle (the ones you use for protein shakes that have the little round whisk in them) and then just keep it in the fridge. Then just shake it back up and use it on your salad. Balsamic dressing is one of my favorites. The dark and rich balsamic flavor is perfect to add a bold flavor to salads. Use a little heart healthy olive oil and a little honey to take the edge off the vinegar and you’ve got a delicious dressing that’s simple, healthy and point friendly. I love that it doesn’t have all the added colors, flavors and sweeteners of the store-bought varieties. Goat cheese is DIVINE in this salad. It’s creamy and bold in flavor, but is also a little tangy without being too overwhelming. Some stronger cheeses can be a bit much in a salad, so you really have to choose your cheese carefully. I’ve had blue cheese that’s amazingly good, and I’ve had blue cheese that you could smell and taste from the other side of the room. But goat cheese is a milder cheese but really adds to the flavor of the salad. If I have a few extra Points to spare, I’ll add a handful of lightly candied walnuts or a few slivered almonds to add a little more crunch to the salad. This salad is perfect for lunch; you can pair it with a piece of fruit or a few crackers or chips if you like. It’s such an easy salad with just a few ingredients. It’s perfect for lunch, a side salad or even Sunday brunch! It’s low in points but has all the flavors of decadence that you can indulge in without the guilt! A simple, high protein salad that’s as delicious as it is lovely. The creamy and tangy goat cheese is the perfect complement to the sweet and tart strawberries. All balanced by the tender grilled chicken breasts and fresh spinach. Toss all ingredients, except the chicken and goat cheese in a large bowl. Toss all ingredients, except the chicken and goat cheese in a large bowl. Slice the chicken into thin strips, and lay atop the salad. Sprinkle the crumbled goat cheese over the top and serve. Skinny Girl has a line of salad dressings now that are ZERO points. I have been using the Raspberry vinaigrette that is wonderful on a spinach strawberry salad I have been making this all summer. Saves a lot of points over oil.